Michael Josephson is the founder of Josephson Institute, which runs Ethics Centers focusing on youth (CHARACTER COUNTS! ), sportsmanship, business, public service, and policing. In this blog Michael takes on the issues that define our days and lives — as he did for 15 years over the radio and on CharacterCounts.org. We welcome your comments and feedback. Thank you for “LIVE A LIFE THAT MATTERS”. I will pass it on to our children because it is not only good advice, it is the right advice and the way to live in the context of their faith in Jesus Christ. I think the many inspirational songs I have written would fit well with your blog and might be of interest to your followers. All of this sounds so good, but it is all secular. In a few generations or less, you/we/I will be forgotten to the world. All that matters is our obedience to God and that will last forever. 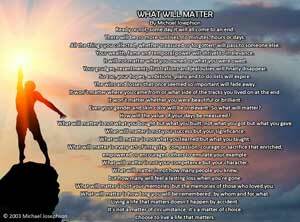 I was sent “Live a Life that Matters” by a friend, and I just watched it. I noticed at the end of the presentation, there is a comment of “unknown” regarding the music. The music track is titled ” Today, Tomorrow and Forever” from the Album “Memories of the Fall” by Ernesto Cortazar, published in 2010 by Piano Drops Music and Publishing. Please add this information to your presentation. Thank you very much. I will find someone who knows how to do this. Can I ask how you knew this? May I download the song either from the Josephson’s site or another site? And of course, I was uplifted, needed and enjoyed the poem set to the music. That’s a given. Thank you. I played the video “What Will Matter” as a devotional today at our church. Not many attendees but those present loved it. It is beautiful. We opened with the congregation singing “He Lives” and closed with all of us reading aloud the 23rd Psalm. Thank you so much for the video. I received it as a forwarded email and knew immediately it would make a good devotional. I have suggested to the youth leaders that they show it to the Senior Youth. I just wanted to tell you how beautiful What Will Matter is. It makes me cry every time I view it. The music is absolutely and is called Today, Tomorrow and Forever and is performed by Ernesto Cortizar. It is the perfect fit for this beautiful and inspirational video. Thank you for your website. For those on the great search, I also recommend reading up on the teachings from Silver Birch. There are several books available from the internet and even an audio on YouTube. Dear Michael – I just wanted to let you know that while you don’t know me or my family , YOU have mattered to us and YOU have made a difference in our lives. Some time ago, when I was still living in Southern CA (where I and my children were born and raised), I wrote to you on your website to tell you the story of how when my two sons were in school, not yet old enough to drive, I would drive them to school early each morning, to before-school sports or band practices. We always had KNX radio playing in the background. Whenever your segment on “Character Counts” came on (at 6:55 am?) our conversation went silent so we could listen to your message…and then we would discuss what we heard. A few years later, when my oldest son was a senior in high school, he became an Eagle Scout. In the speech he gave at his Eagle Court of Honor ceremony, he recognized me as having taught him that “Character Counts”, and he described what that saying meant (i.e. summarizing many of the things he heard you say) . I wrote you at that time to let you know that YOU deserved the credit. Fast forward almost 14 years. My husband and I are now retired in Florida and that Eagle Scout is now a fighter pilot in the US Marines, based in Beaufort, South Carolina. He has been serving as the XO of the Marine Corp Air Station for the past year and we could not be more proud of him. He exemplifies “Character Counts” (as does our younger son, who now lives on his own in Switzerland, working for a “Big 4” accounting firm). They are both spreading lessons learned from you around the world. I have a recent picture of this Marine Corp Captain and his little girl that you might appreciate (just let me know how to send it to you). I thank you from the bottom of my heart for all you have done and continue to do to help make this world a better place. I am blessed and honored that you have had such a positive impact on our lives. Thank you for persevering in such challenging times. I’m sure it’s not been an easy road, and sometimes may seem thankless, but rest assured, YOU exemplify what really matters. Thank you for your gracious and uplifting note. It is deeply appreciated. Your note was timely and potent as I try to deal with my semi-retired status and assess what I can still do to justify my personal good fortune and access to so many people struggling as I am, to live a life that matters. – Please send your picture to msj@jiethics.org. I just received and watched the video and was so blessed. My husband and I have spent the last 43 years of our lives as missionaries in Spain. We are financially retired but continue here with what God has given us to do. I am constantly surrounded by young moms and singles with great ambition. I would love to have permission to translate this into Spanish. I’m taking a class at Apple here in Madrid and am thinking of getting a program that would allow me to at least subtitle worthwhile presentations such as this one. Would you be willing to give permission for this if I end up buying the program?